Our journey to the island of Panarea begins with “San Pietro”, the main economic centre where the pier is, used for the landing of hydrofoils and ferries. A large number of narrow streets wind from the port area up to the three built-up areas of San Pietro on the east side, Drautto to the south-west and Ditella to the north-east. Due to the small size of the island you can visit it entirely on foot. Another possibility is to take the classic and picturesque aeolian taxi, the “Ape”( a little traditional three-wheeled vehicle) cleverly designed for the transport of passengers, or you can take the classic electric car too. The “Contrada of San Pietro” is the location of the main town centre and of the pier. It is also the centre of nearly all of the tourist related activities and of the island’s nightlife. 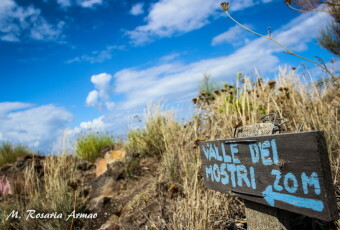 The first surprise the island offers to visitors is a thermal spring next to the pier near “Punta Peppemaria”. The inhabitants and visitors enjoy the thermal spring and its therapeutic effects. Hot water (50°C/122°F) gushes from under the sea-bed. Walking through the narrow street that leads to the mountain the visitor will find himself surrounded by the built-up area of the “Contrada”. We recommend that you not only walk through the main streets but through the small paths too; they will surprise you with breath-taking shots of the landscape.The residential area is built along a gentle slope with artificial terraces that were used for agricultural purposes, its buildings still have an intact architecture with a typical white colour in contrast with the greens of the palm trees, of the olive trees and of the caper bush/flinders rose together with the ever-changing colours of the bouganvilleas, a plant widespread over the Aeolian Archipelago. Walking through the higher road you’ll find the small church of Saint Peter, the main religious building of the area and starting point of the procession of the patron Saint of the island and the fisherman beginning between the 28th or the 29th of June. The procession, after going through Panarea’s streets, continues by boat and ends in the evening with a classic firework display. The church, built towards the end of the XIX century but consecrated years after, testifies the devotion of its people to their patron Saint. To him was entrusted the hope of a peaceful life and of an abundant catch. It was this devotion that moved the inhabitants towards the building of a suitable location to be used to carry out the usual religious activities and which could hold a bigger number of believers, because in those years the population of Panarea reached the 1000 .Among the streets that form the area of San Pietro, almost hidden, there is the branch of Lipari’s “Bernabò Brea” museum, set up in two areas previously used as a storage room and a tank area. 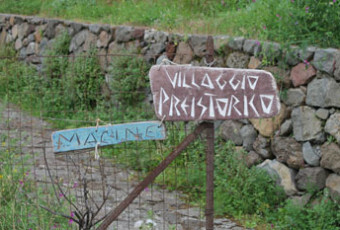 The museum exhibits historic and geologic remains dating back to the Neolithic and the mid-Bronze Age, almost all found in the prehistoric village Capo Milazzaese, the Calcara and Piano Quartara. From San Peter’s church, through the panoramic route towards south, you reach Drautto, where a handful of houses stretch along the coast. The area takes the name from the Arabian Turkish pirate Draught, who chose the island as a haven for the mooring of his own ships. Walking south of the inhabited area, after having gone beyond a rocky promontory you reach the popular beach called “Caletta degli Zimmari”,where it’s possible to lie down on its soft sand and dive into the crystal and fresh waters of the Tyrrhenian Sea. Going on the same direction you reach Punta Milazzese, location of a prehistoric village where nowadays you can still see the ruins of the 23 huts that formed the settlement. From here, an old path takes you to Cala Junco, perhaps used as a dock for the village in the prehistoric times. This amphitheatre-shaped bay is surrounded by bizarre rock formations that create a natural swimming pool. This bay is considered one of the most beautiful not just of the island but of the entire archipelago because of the amazing colours of the water lapping against the shore that goes from emerald green to deep blue, via turquoise. During the summer, Cala Junco is very crowded but you still have the chance to enjoy the refreshing water and to relax in what can be called a heavenly corner. After a brief stretch of road, connecting the harbour to the built-up area of San Pietro, and a turn on the right towards north, you reach Ditella. It’s a small area known for its hot springs and for the harmless fumaroles of Calcara beach, placed in a basin, that may be what’s left of a volcanic structure, which give an unusual view: the gases of the fumaroles come out from the soil making it hot, changing its colour and creating cracks in it.